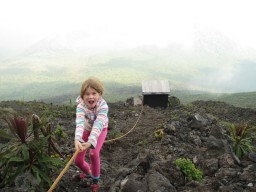 The day after the 2014/15 school year, Zoë and I flew to Rwanda. 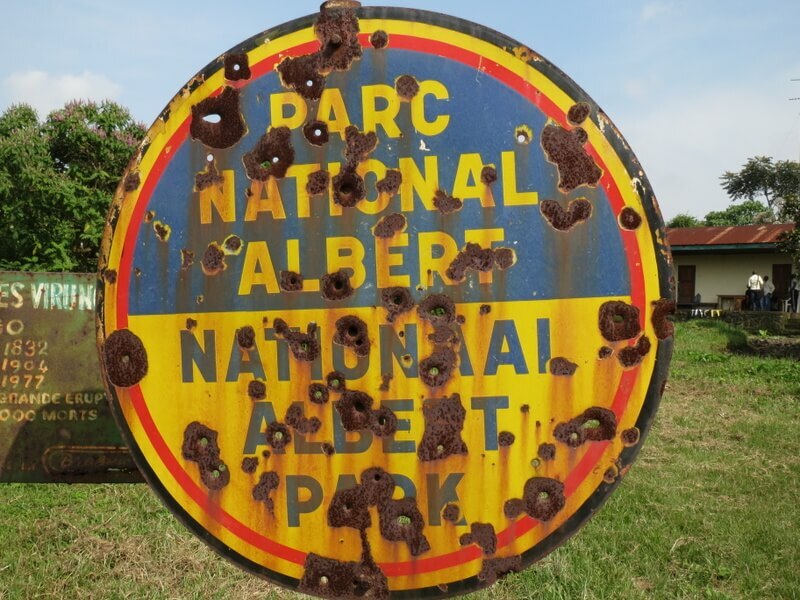 We spent a couple of pleasant days camping at the youth hostel in Kigali and then headed for Goma, just over the border in the Democratic Republic of Congo. 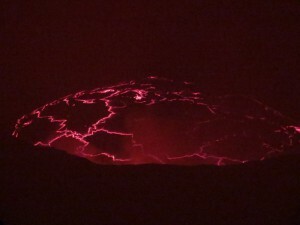 The highlight of our trip was definitely climbing Mt Nyiragongo, which has the world’s largest lava lake. We climbed up to the rim of the caldera at 11,000 feet and slept in decrepit huts on the rim, the lava lake was quite a show after dark. Before we left Kigali, we also visited the sad but poignant Genocide Memorial, where a quarter million victims are buried. It’s amazing how well the country is doing, given this relatively recent tragedy. 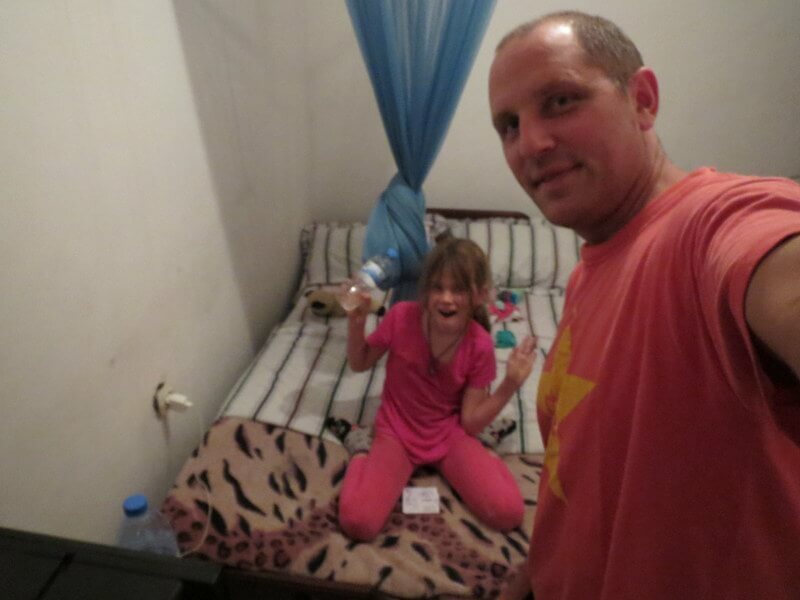 We also ran the friendly Kigali hash. Coming and going from Goma in the DRC, we stayed in the Rwandan beach town of Giseyni. 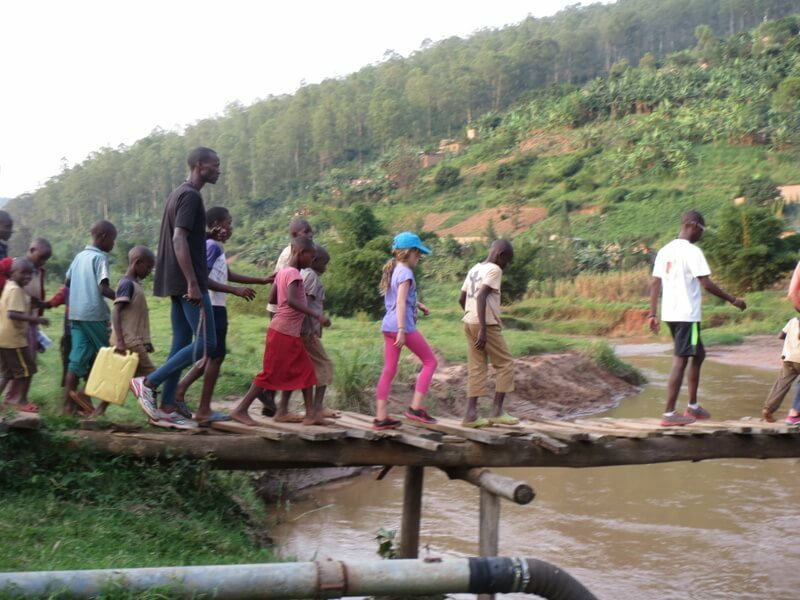 We did a two day hike along the shore of Lake Kivu, where we did not see a single foreigner and had fun exploring the beautiful shoreline and villages. Click on a photo below to open up a photo gallery. A great day in the countryside with friendly Rwandans and expats. 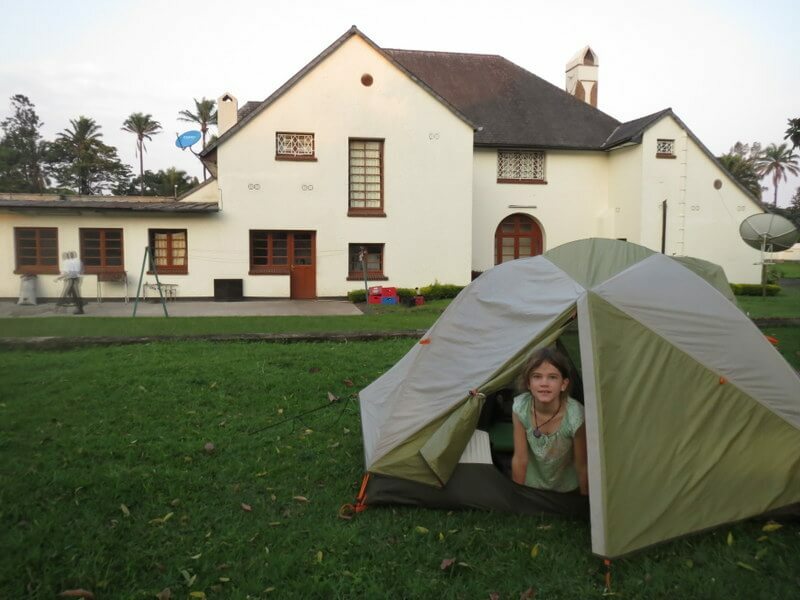 Camping behind the youth hostel in Giseyni, on the Rwandan side of the DRC border. 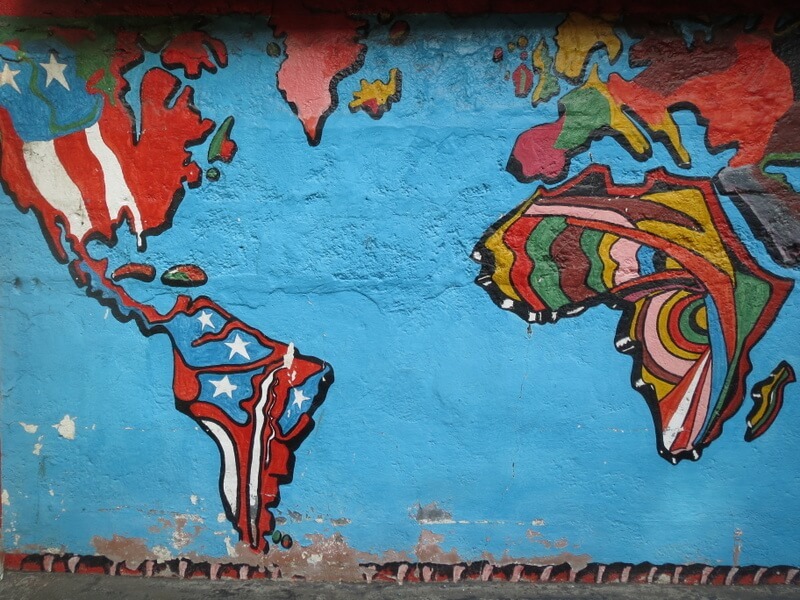 Colorful mural on the wall of a bar in Goma DRC. 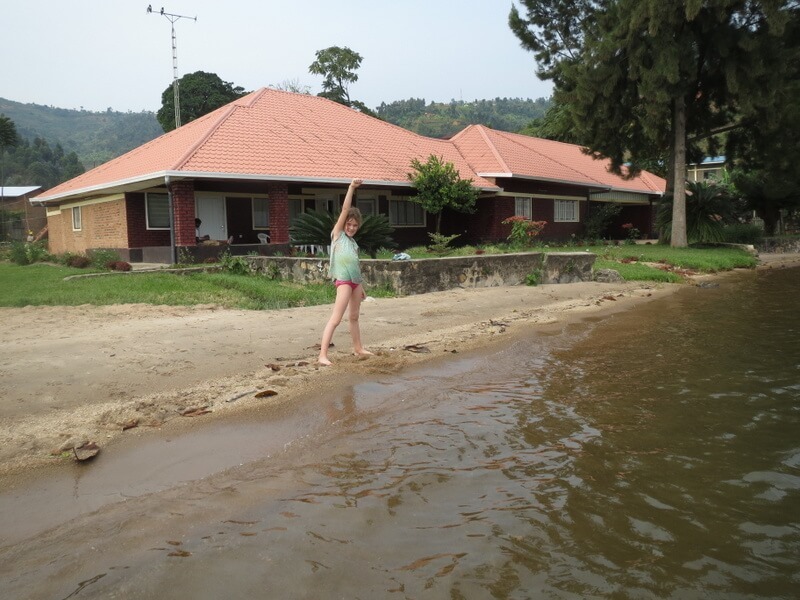 Our dingy hotel in Goma. 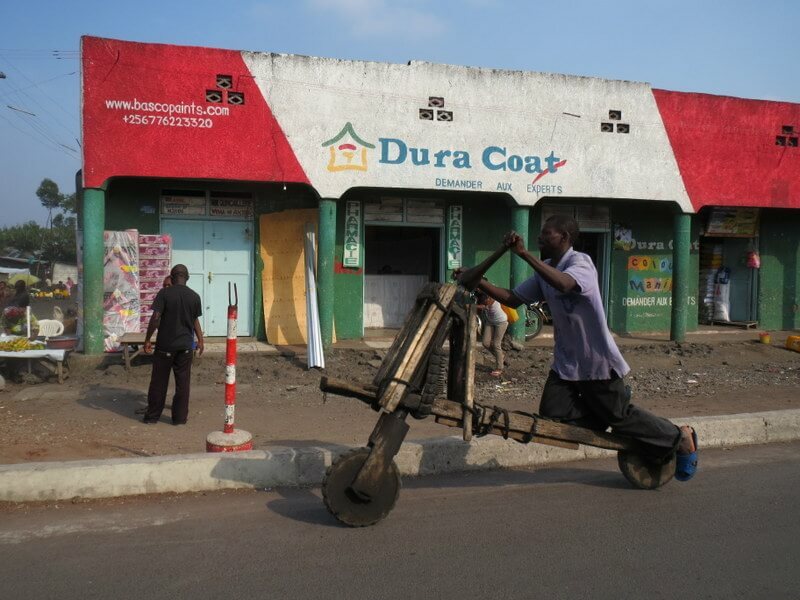 These carts are everywhere around DRC – they can build up some speed on a downhill and they have no brakes! Entrance to Virguna park, previously National Albert Park. A safety rope to get you to the bathroom from our huts on the rim of the volcano. 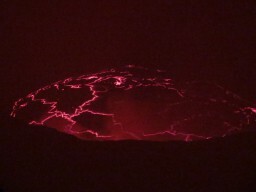 The lava lake is quite a show at night! 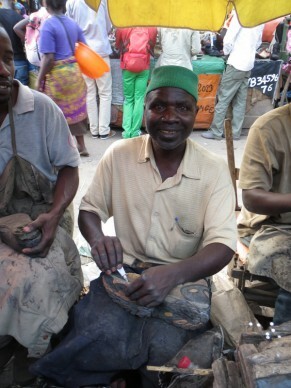 This guy in a local market sewed my shoes together for an hour. 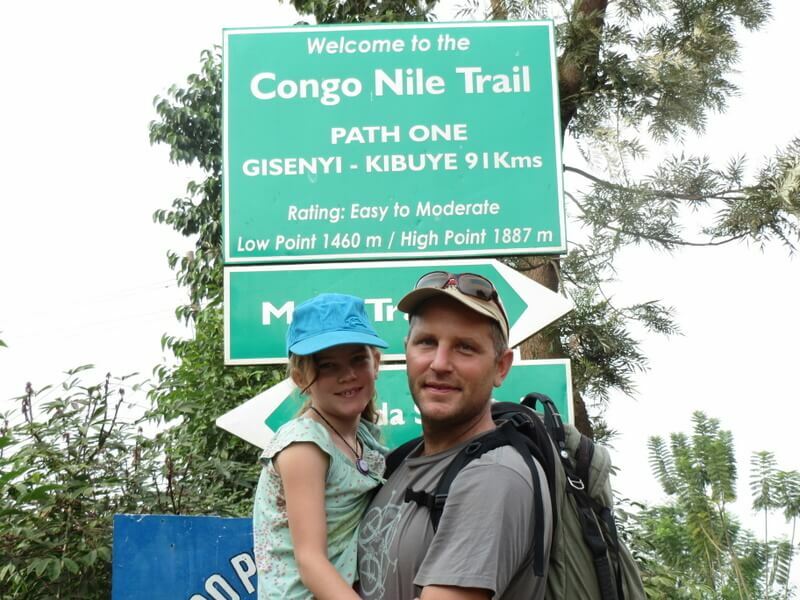 The beginning of our two day hike on the Congo Nile trail. 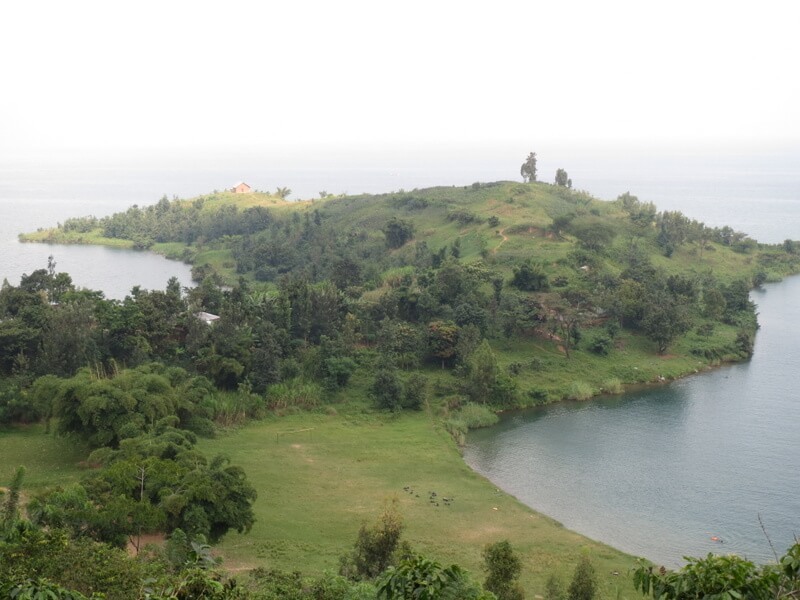 Typical scenery on the trail — the shore of Lake Kivu. We found this mancala game in the ground on the side of the trail, with seeds as pieces. Unfortunately, we could not really remember the rules! One of the pleasant guesthouses we stayed at on Lake Kivu – just $10 and right on the shore of the lake. 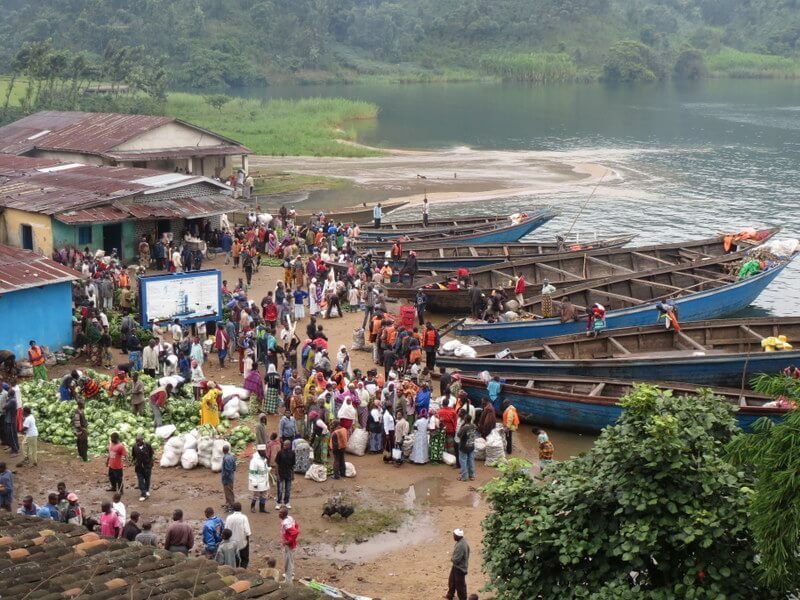 Local fish market with boats coming across Lake Kivu from the DRC to sell their fish. 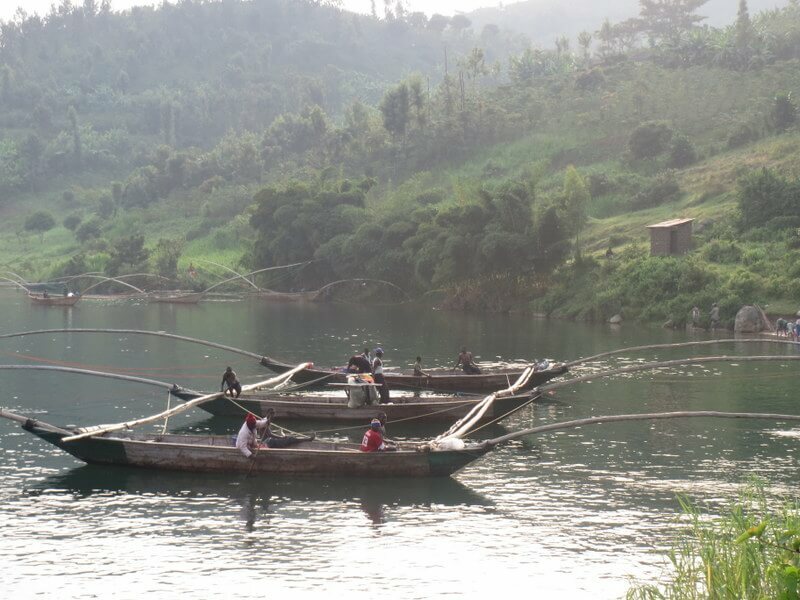 Fishing boats on Lake Kivu, the fisherman fish at night so their lights attract the fish. They hang their nets between the long poles.